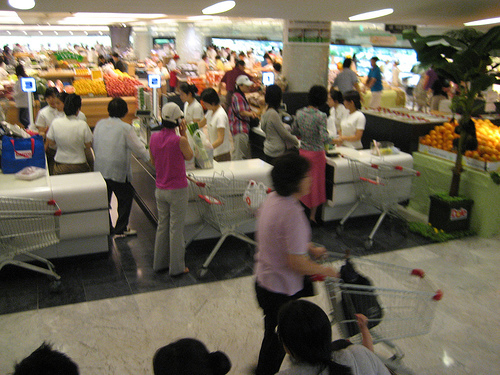 Grocery shopping in Korea can be overwhelming for those who are new to the country. As for shopping for basic necessities - you have many giant super market chains in Korea now (unlike the old days where traditional markets were the majority) - but which ones?! There are other ones such as LOTTEMART, COSTCO, HOMEPLUS, NongHyup...etc... these are all bigger chains and are located throughout Korea. If you're new to your area - you can ask a friendly local where they shop for grocery or just walk around your neighborhood to see what's around the area. You can go to map.naver.com to see more. I like to use NAVER MAP in my iphone to find stores - it also has a "street view". 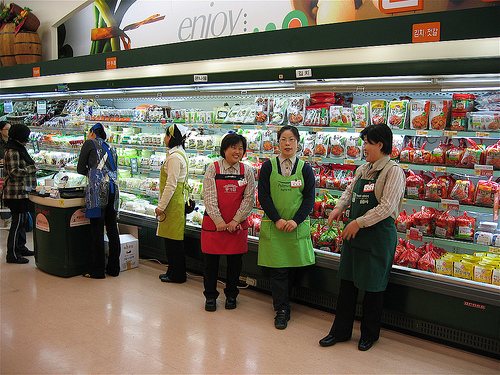 Most Korean grocery chains are convenient enough - but a few new things here and there that you have to get used to. There was a time where it was hard to find "heavy cream" anywhere - but now most bigger grocery stores will have these "special items" (referring to mostly foreign goods like peanut butter or oatmeal..) - but don't be surprised if your favorite items are not available. But it's getting better over time. I'll start with EMART - so far the most frequented one - at least for me and the locals in my hood. It carries pretty much any household necessities+.... From fresh produce/meat/fish.., wine/alcohol, furniture, home goods, kitchenware, pet supplies (and some pets), garden-home, beauty/makeup, clothing, electronics, books, office/school supplies, toys, foreign food (sauces/spices)... It has it all. If you need anything for the house - Emart has a good chance of carrying it. However, not all Emarts are the same - some are smaller or bigger with less or more variety of goods. It's fun for me to see what different Emart carries. I also find the prices/sales vary through different branches. The EMART in Gongdeok(station, exit 7 - walk straight out the exit on your right) is fairly new and has pretty much everything you need. They are open until midnight. You have to bring your own bag - or pay for bags(paper/plastic). I always bring my heavy duty bags. I haul my groceries home (walking- a good workout), so it's no problem with transportation, but you can take the subway/bus or taxi home at your convenience. We also have LOTTE SUPER in our area. It is the smaller version of LOTTEMART and thus smaller in size. I find their fresh produce cheaper and better than Emart. They also have some amazing sales! They deliver your groceries home at no charge - you have to have a Lotte membership card - free of charge! But I am not sure if this is the same for all Lotte Supers. You pay at the counter and push your cart to the "boxing station" where they will pack and deliver your goods in 2~3 hours time. I think you will have to reside around the area. These are the grocery stores in my neighborhood that I frequent. I don't shop at the traditional markets because, realistically, it's not very convenient. I don't also trust their products so much (sanitary/quality...etc) ... As much I want to support the smaller markets(stores) - it difficult. A few folks might find grocery shopping overwhelming, but if you need any help - don't hesitate to ask for it - there are plenty of sales clerk around to help you. And if you can't speak Korean - no worries. They will usually get someone(who can speak English) to help you. I hope these tips below will be helpful. Bring your own bag. It's more convenient to haul your goodies in a bag big enough/comfortable to carry around. You will have to pay for bags if you do not have one (I'm not sure how much exactly - but not more than 1000won). The bags come in paper or plastic. You can reuse the plastic bags as "official trash bags" (you can only throw your trash in these bags) - which I believe can be used for any area in Korea if I am not wrong here. Many big grocery chains will have a "mandated closed day" from the government. A good idea to check/call ahead to make sure they are open. Gongdeok Emart is closed every second and fourth Sundays every month. Grocery stores are usually packed and busy - avoid those times if you want to avoid the crowd (usually on weekdays/before dinner) and want to have your space(literally) to shop around. There are sales clerks who will try to sell you a certain item quite aggressively (asking questions/talking to you) - but don't be fazed, they are just doing their job - move on and do your shopping. 1+1 sales are great deals! Look out for good sales! As a frugal shopper - I find some prices ridiculous in Korea. From a bottle of shampoo that will cost over 12,000won - don't buy these. I have seen them on sale for 3900won. Don't let the price fool you into thinking it's the "best" one - prices are up and down in Korea. It's very common for a price to be different from a week before. I always find that eggs (fresh produce has always been fluctuating) change in price. So the best way to deal with changing prices I find is to keep a mental log of the prices of these items. When they are higher than usual - I just wait until they go on sale or get back to normal price - it may take a month or two for them to go on sale or down in price. Shop for sales - especially on shampoo, toilet paper, etc...these items come very cheap once they go on sale! Avoid buying things in full price. Register for a membership card. Lotte membership card is great! You get points added up and can be used like cash on checkout. I've already bought a few yummies with my lotte points :D Lotte membership cards can be used in many different stores, including Krisy Kreme. Keep track of the price of the items you buy the most. You will notice how much it fluctuates... I know the price of my eggs, bread, rice,..etc.. if you don't keep a record of it in your head - you will be paying too much and not even know it. Stock up on necessities that go on sale such as, toilet paper, detergents, shampoo, rice (refrigerate them), fresh produce. If you have the space - these items are great in stock. I stock up about 2~3 months of these items at most. 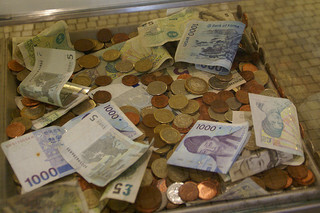 Visit your local Korean bank to ask for a discount card on grocery stores. Many cards will come with at least 5000won discount every month for shopping at your grocery store. These cards are linked with your bank account usually paid in full (no interest rate). If you're bank is with KB, they have great cards that offer discounts when you shop at these grocery chains. "Wisehome card" is just one of the cards I use for phone, grocery, utility bills discount - which saves me a great deal every month! You can visit your local bank to ask for cards that offer these services. Amazing read! Thanks a lot!! the nice quality writing, it's rare to see a great blog like this one nowadays.